Based on one of the most wildly popular, fastest-growing free daily e-mail subscription services, this Hungry Girl original audiobook is filled with survival strategies for anyone who wants to make guilt-free eating choices, anywhere, anytime. Learn how to 'chew the right thing' from any and every restaurant menu, on airplanes and even from the hotel mini bar. Get the 411 on guilt-free cocktails and hors d'oeuvres, successful snacking at the office, and how to survive salad bars and brunch buffets. HUNGRY GIRL: THE OFFICIAL SURVIVAL GUIDES is brimming with tips and tricks for making smarter food choices no matter where you are. 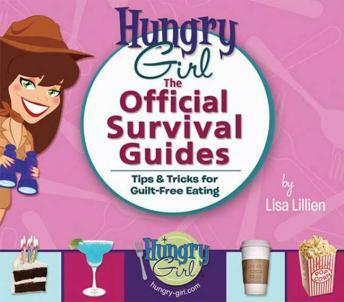 Told with Hungry Girl's inimitable wit and sassy style, HUNGRY GIRL: THE OFFICIAL SURVIVAL GUIDES will help you tackle any and every food challenge. No problem.